Click Here - If you don't read anything else on the Great Joy in Great Tribulation www site, READ THIS. into the war with all the forces of the Antichrist. Yes, we need help. We are NOT a 501c3. Soon whatever we have in the way of paper assets will be gone. Even the gold and silver will probably be declared illegal and confiscated by the Luciferian New World Order. That is OK, because the L-rd G-d Almighty is our Source. He is El Shaddi, the All Sufficient One. NOW is the time to lay up treasures in heaven. I would advise divesting material wealth, and storing it up as treasure in heaven. I want to get very specific. If you use your material wealth to support the preaching of the gospel, then you have it stored up in heaven. Also, you will be much better prepared to face what is ahead in the great tribulation, before you get to heaven. When the banks and stock markets crash it won't bother you. Also I know that some of you would like to hear from Betty. We need your help. I can not deny that. I am also going to encourage you to support Brother Ebenezer. I know that will mean treasure in heaven. If you send faithful ministers of the gospel any of your treasure you will find it safely stored in heaven. Yes, there are people who do lay their life on the line now to bring souls into the kingdom. JESUS CHRIST IS COME IN THE FLESH! Alleluia Yeshua, Jesus! This is Sister Betty. I would like to share with you highlights of another day with The Lord Jesus Christ that Jim and I had this week on a bible run. Many times I could write about glorious things Jesus does when we go witnessing with Him. But, sometimes our bible runs to Nicosia are just awesome and must be shared. All Glory to God! When we left our flat, a short way down the road we came across an elderly man we had not seen in several months. He lives on a poor mini plantation. He lives in an old, old rock house, one story, no big white columns. I say plantation, because he has many orange trees, olive trees, a vegetable garden and I really don't know what all is grown on his property. We met this old Cypriot gentleman (who loves Jesus) one day when we cut across the road leading to his house. He had an old, ragged, but clean, robe on and was clean shaven. A Sri Lanka girl (who also loves Jesus) takes care of him and was walking with him. He was not well, but every day would walk with his cane and the Sri Lanka girl, along with a big golden retriever dog, around the long driveway that circled the orange trees up to the front of his house. They were so blessed, as we were, as we talked about the Lord Jesus Christ. He had the girl to give us artichokes out of his garden and we were on our way. We were so excited to meet a new Cypriot friend that spoke good English, as the Sri Lanka girl did also, and they both love the Lord Jesus. Alleluia! We saw the Sri Lanka girl at the Boot sale (flea market), one Sabbath and she said the gentleman was doing very good. But she was both sad and happy. She was going back to Sri Lanka in a couple of weeks. Her Visa would expire then. She said she loved working for the gentleman, he treated her like she was his daughter. Alleluia Yeshua, Jesus. The next Sabbath, when we went to the Boot sale to give out tracks, we took a Sri Lanka Bible and a picture I had taken of her on her knees hugging the golden retriever, just in case we saw her. She couldn't take the big dog to Sri Lanka but she could have a picture. We saw her and gave her the Sri Lanka Bible and the picture. She was so happy to get them. Thank you Jesus! Glory to God, we rejoiced with the old gentleman when we saw each other yesterday morning. It was wonderful to see how well he looked and how well he was getting around on his own. We told him we had to go, we were on our way to Nicosia to the Bible Book Store. He was very discouraged and said there seemed to be so little purpose left in life for him. Jim told him that one of the greatest purposes in life is to talk to God and ask for Him to be glorified to heal people as He was glorified to heal him. To ask that people would have ears to hear the Gospel and hunger to read and KNOW the Word of God. He was very much encouraged. Thank you Jesus for letting us see him again. Lord willing we will go visit him before long. We had to go to the bank to get money to get the bibles. As I was putting the money in my purse I told the lady teller that we were using the money to go to Nicosia and buy bibles. I told her we give the bibles out in the streets, parks, etc. to all the many nationalities that are here in Cyprus, in their language. We give them out free because everything from God, (as I was pointing up), is freely given so we give them free. I could not believe she did not know what I was talking about. She did not know what a Bible was, and I said THE WORD OF GOD in a book. (Very seldom I am out in public without my bible in my hand, and this was one of those times, sad, sad, PLEASE FORGIVE ME LORD JESUS). She didn't know who I meant when I said GOD. I told her I would bring her a BIBLE. She was happy and said ok. Other people in the bank heard what I was saying and understood. Glory to God! At the bus stop a man came up to us and was so friendly, asking where we were from. We told him Texas, in America. Jim gave him papers about Jesus, America, and Prince Charles. He was from Ireland. He was so interested in talking about Jesus with us. His city bus came before our bus came. He looked back at us when he stepped on the bus as to say, I don't want to leave yet I'm not through talking with you. Well, at least he has the papers Jim gave him about Jesus, etc. to study on. Alleluia! Cyprus bus service is not that good, you better get on your bus when it comes. It might be a while before another one arrives. Finally, our Nicosia bus came. Soon as Jim was seated he was giving out papers to the Bangladesh and Persian young men. A Greek man turned around in his seat and he wanted something to read in Greek. Glory to God! Then, for everybody's enjoyment Jim played "Little Boy From the Carpenter's Shop" by way of the computer. Thank you Jesus for batteries for computers. If you have heard it you know it is one of those songs you can't play softly. It is shouting music. Alleluia Yeshua! We usually take the 10:00 bus to Nicosia. The driver is a Christian. This 10:00 bus does the mail run. We go by the mail sorting plant for Cyprus. The driver gets out at the plant, opens the window at the seat behind his drivers seat where the mail is. Jim hands me the computer, gets up and goes to the front and hands the mail thru the open window to the driver. FINISHED, the mail has been delivered to be sorted. In nothing flat were on our way. (The Greeks like the word FINISHED. That's when they slap their hands together and say FINISHED) One word the Greeks say that we understand. The people on the bus are shocked with this procedure. They see quite a witness of a Brother in Jesus helping another Brother in Jesus. Not being passive like everybody usually is on the bus. Alleluia Yeshua! Jim started doing this and who knows, the driver may have helpers on the days Jim isn't along, from the example he sets. We usually ride all the way to the Bus Station but this time Jim said, "let's get off at the next stop". We walked between two rows of buildings and came to a very large building. It was the Americano College. There were 5 or 6 young men standing out beside the building. Jim asked them where they were from and they said India. Jim had tracks in their language, Hindi, and gave them all one. They were shocked Jim had something in their language. They asked if we had been to their country in order to have these tracks in their language? We have been asked several times that same question from people from other nations. Anyway, they understand English and received cheerfully the words Jim spoke to them about Jesus and getting to know the true Jesus. They were reading their tracks when we left. Alleluia Yeshua, Jesus. We walked on to the Bible Book Store. Last week the lady that runs the bookstore was sick and asked Jim for prayer. She has seen the manifest power of God heal her before. In the last two years her faith has grown from little faith to big FAITH. Praise the Lord Jesus! She was happy to see us. We picked out the Bangladesh, Sri Lanka, Hindi and Armenian bibles we wanted to get. I remembered the lady at the bank and said we need some Greek bibles, one for the Lady teller at the bank. Jim was getting 5 Greek bibles off the shelf when the lady said, "Wait, I have some complete Greek bibles upstairs that I can sell to you for 3 Cypriot pounds instead of 6 pounds”. Just 1 page is folded into the seam of the bible and we just very carefully snip it and unfold that page. Glory to God! We bought 10 of them. She is going to save the rest of them for us. We will get more next time we go on a bible run. Alleluia Yeshua! He gives his people favor. Alleluia! Jim called Pastor Banjo from the book store. Pastor Banjo had a young Pilipino man named Alvin, with him. Alvin is helping Pastor Banjo a great deal with the Pilipino Church. Pastor Banjo wanted Alvin to meet Jim. We walked with them over near where the Church is. They saw a friend that runs a Western Union - Telephone service on the corner across from the Church and the fellow invited us to come in. The man that owns the Western Union service is a Catholic and a friend of his had been trying to convert him to be a Mormon. Jim said, "I have exactly what you need to see on this computer". Jim showed him the God Makers movie and also the DNA movie about what the Mormon cult ACTUALLY believes. The TRUTH about Mormon beliefs is embarrassing to Mormons. The Mormon would not acknowledge the truth of his Mormon church. He was caught in some very obvious lies as he said that it was not true what the factual movies Jim showed him, on the computer, did clearly show and prove. Jim bound the demons in him. He settled right down. Jim told him he would burn in hell with the 2 false prophets Mohammed and Joseph Smith. He wanted no part of a KJV Holy Bible to read. He said he had the book of Mormon. The Catholic man gladly received a Holy Bible in Greek. Both the Catholic and the Mormon watched the movies and the Catholic got delivered of the Mormon demons he had received. He wanted no part of the Mormon church. All we can do is Pray, and Pray some more that the Mormon will check the things out he saw on those two movies. He sure was told the TRUTH with NO uncertainty. We can still pray that he could accept the truth Jim told him about the Lord Jesus Christ and will come to know the Creator and Redeemer of this world. It was truly a God setup. The Catholic was in trouble and he was delivered. Glory to God!! Pastor Banjo wanted us to go over to his house with him and Alvin. Jim said to stop by some pizza place and he would get a large pizza for us to eat. Alvin went in with Jim to order. Soon Alvin came out to the car to get 2 of the Greek bibles for the pizza workers. Alleluia Yeshua. At Pastor Banjo's house Jim was talking to Alvin about if he had read the Bible through line upon line and precept upon precept? You could tell he has a great hunger for the Word of God. His answer was no, he had not. Jim just happened to have a KJV Holy Bible he had bought for himself but had not marked it up yet so he gave it to Alvin so he could start reading the Word of God the way he should. Before we left Pastor Banjo's house Jim led us in a bible study of Titus. Alleluia Yeshua! Alvin took us to the bus and showed us where he and his wife lives. He lives right across the street from the bus station. His wife works for the Ambassador of Israel in Cyprus, a Jewish man. Isn't that interesting? Jim and I sat right behind the bus driver on the way back to Limassol. As people were getting on the bus, Jim was handing out Bangladesh tracks to the guys getting on the bus. This was the 4:30 bus we were catching and most of the people getting on are Bangladesh. One of the ones he handed a track to, stopped and gasped and said, "this is my language, how did you know"? Jim pointing up said "He knows". Alleluia Yeshua, Jesus! The bus driver had his daughter with him, looked to be about 11 years old. He was letting her give out the tickets and collect the money. He was standing by in case she needed him. Then she was helping him make a report. She was setting in the seat right inside the door and every chance she got she would look up at us, for we are peculiar looking people that don't fit into this world. Alleluia Yeshua! The driver even gave us favor and let us out of the bus about a block closer to our flat than the normal bus stop. Before we got off the bus, Jim asked the driver if he minded if we gave his daughter an Orthodox Holy Bible and he said we could. She looked really excited about it. Bless the Lord! We got home about 6:15. I called our dear Sister in Christ, Maria Fullah, a Greek Cypriot widow with a hotline to heaven. She is 75 yrs. young and she loves the Lord Jesus so much. ( the Greeks say "too much" for "so much".) Weird, you can't love Jesus "too much". Maria just returned from a month in Greece with her granddaughter that is in college. Maria said she met a lady while visiting that she became close friends with, and witnessed to her about Jesus. The friend got saved and was full of joy but had no bible. Maria gave her the special bible we had given her, Alleluia Yeshua! That is how Sister Maria is, she will give you the shirt off her back. Today I took Maria 2 Bibles and she already had one promised to a lady up in a village. I told her I will bring her more after we make the next bible run. Tomorrow I will take a bible to the lady teller at the bank. Today, I had the bible in my hand and my destination was the bank, to give the bible to her. Jim and I were at a bus stop and Jim was going to ride down town to get a computer problem fixed. I was just sitting with Jim until his bus came and then I would walk on down to the bank and give her the bible. But, God had another plan. This Greek woman and her son and daughter stopped. The lady said, “would you pray, my son wants you to pray for him.” Jim prayed for young Jon. Jim asked if he loved O Iseous Christos, and he said yes. Do you have a bible? No. Would you read the bible if you had one? Yes. So you see why I will take the bible to the lady at the bank tomorrow. Yes, young Jon is NOW reading the one I thought she would have. Glory to God. Alleluia Yeshua. Oh what a beautiful day the Lord made for us here in Cyprus. We could not let this sun shiny day go by without getting out and telling people about our Lord and Savior Jesus Christ. After Jim finished up with PalTalk and finished getting a message out to the prayer warriors Sunday afternoon, we decided to go to the Municipal Park. Lots of families go to this park on a beautiful day like this so the children can play on the swings and things, and they also have a small zoo. It is just a lovely, peaceful, setting with beautiful flowers and trees. When we were about a block away from the park we met two young men that spoke to us and stopped to talk. They were both from Bangladesh and spoke pretty good English. Jim showed them the Bangladesh teaching Bible. You should have seen their faces, it was really comical, I wish I had my camera to catch their expressions. Their eyes got big and their eyebrows SHOT UP, they were so surprised. Jim showed them the Bible was highlighted and marked for him to teach from. So, Jim got their phone number and he will get Bibles to them. We decided to walk around a little bit and give out some of the Booklets. Jim has been able to make 18 page Booklets off the computer in Russian and in Greek. They are really neat, he put a sketching of Jesus walking on water with a ship in the distance on the cover. Many people were eager to take the Booklet. Alleluia! We came across a fellow we see all over town, who is always so happy to see us. Last time we saw him, before today, was last week. He was sitting on a little stool on the sidewalk of a very busy street with a radio playing in his lap and he had a tin can wrapped in holiday paper, holding it. He is so precious. Oh Lord just bless him. We are SO blessed when we see him. He is a child of God. I bet Jesus loves him very much. Anyway, he has always wanted an English Bible and we had one for him today. Alleluia! We also saw two Sri Lanka girls sitting over in an arbor. When we started over to where they were the younger one got up and went down a sidewalk out the other side of the arbor. They didn't see us coming or I don't think she would have left. You know, the Lord may have had her to leave because it would have been hard for us to give to one and not the other. We had talked with these two girls before. But, this time we had a Bible with us in their language so we gave it to the girl that was there. After we visited a little bit, as we were leaving, the younger girl came back and saw the Bible and she ran after us asking if she could have one. We will take her one next Sunday, if the Lord Wills. Sundays you will find them in the park. They always have this same man with them, we think one of them may be a nurse to him. He is Greek and always wants a paper from Jim. The Sri Lanka people are such sweet people, they may be just friends with this man who looks forward to spending Sundays in the park with them. Alleluia Jesus! On the way out of the park a lady was sitting on a bench looking very lonely and sad. We went over to give her a Greek Booklet to read and she said she was Arabic. Jim had a Gospel tract in Arabic in his case for her. She was so pleased when she saw it was in her own language. We stopped in a restaurant about half way between the park and our flat. We decided to go in and have a salad, our first raw vegetables since the Lord released us from the fast He had us on. We don't eat there often, but they have always welcomed us with open arms and most of the waiters, bus boys, managers and customers want the papers and booklets Jim has to give out. They don't treat us like we have leprosy!! Alleluia Jesus! Jim asked one of the waitresses, that came by our table to visit, what country she was from. She was a fair skinned, blue eyed blond, you could tell she wasn't Greek. She said Serbian. Today was the first time in months we had carried a Serbian Bible. She was so blessed to receive it. She went to the kitchen and showed it to George who is Serbian and smiling she said "he wanted to take it away from me" so Jim will take him our last one tomorrow. Jim really heard from the Lord to take that Serbian Bible, and the other Bibles we gave out. Another waitress came by to visit and she was Russian. We gave her a Russian Booklet. She seemed pleased to get it but wasn't too sure if she wanted a whole Bible. She appeared to be younger than most of them, she probably wants more fun time, than reading the Holy Bible time. She said, she would think about it. Jim will have one handy when he takes the Serbian one. After reading the Russian Booklet she may hear the Lord speaking to her heart and she just might want the Bible. We will pray that happens. The people there were so open and kind to us. Even gave us coffee "on the house". Which is rare. Children were waving at us, especially Jim. They really love Jim, he blows them kisses. Would you believe, Jim really is a sweet child of God. His beard fascinates them also, it isn't white enough for them to think he is Santa. Thanks be to God, we do not need any Santa look-alikes around here! Even the parents were smiling at us in a kind way, and not scoffing. The Lord really went before us and prepared hearts. Alleluia Yeshua! Our waitress came and visited with us quite a while. She wanted to know all about us where we came from, how long we had been here, how long we plan on staying, etc. Jim answered all her questions and told her about why Jesus Christ had sent us here, about the people of Cyprus helping the Jews, and Bible prophecy. She said she was going to start reading her Bible. She was a young Greek girl and she could speak English like nobody we have come across. She asked if the Greek booklet that Jim gave her was available in English. She says she prefers to read English. Jim asked her if she had a computer. She said yes, so Jim gave her one of the GJiGT cd's. Jim explained the promise of James 1:5 and a little bit about what is coming and that if she would receive by FAITH the promise of James 1:5 she would hear the Lord talking to her and explaining the scriptures by His Holy Spirit. He told her that we must know Jesus voice, and Jesus wants her to really KNOW him and not just know about him and be involved in religion. When we left there, the beautiful day had turned into real dark, rain looking clouds. I said to Jim, maybe we better walk on the main street where we can grab a taxi if it starts to pour. Jim said oh we will make it home before it rains, I just know God will hold it back for us (this has happened many times). When we were about 3 blocks from our flat, we saw two guys walking toward us and one started hollering "my friend" "my friend" and ran over and hugged Jim. It was the Farsi guy we had met at the bus stop in the last report. We had already given his Bible to him some time ago. He said he was reading it and really learning. The friend that was with him wants one in Farsi. By the way, we would have missed the Farsi guy and his friend if we had taken a taxi. Thank you Jesus! We are so thankful to the Lord that He speaks to the brethren that we can have substance to get the bibles we need. The field is so white for harvest here. So many different nations pass through Cyprus on their way to somewhere. They are mostly poor people who take ships and not planes. God loves them and has prepared their hearts. What a privilege to bring the gospel to the POOR. We do thank the Lord Jesus Christ every day, for every individual, whom He has moved to partake of this grace. We will be off to the Bible Book Store again tomorrow. Alleluia Yeshua, for a glorious afternoon with you!! By the way, it did not rain until we were in our flat. Thank you Jesus for holding back the waters again!!!!! We do thank Him for sending the blessed rains on this nation and on Israel. Most of the time when we get rain here in Cyprus it goes right on over to Israel and blesses them. Alleluia Yeshua! Jim asked me to write this to tell you about this day with Jesus that we had making a bible run to Nicosia. So you know, this is Betty writing. Jim and I left the flat to walk to the bus stop to catch the early bus to Nicosia. When we got to the bus stop, there were two young men waiting on the bus. One scooted down to the end of the bench as far as he could the other stood up and invited both Jim and I to sit. Which is unusually courteous in this part of the world. Then, we saw there was room for all four of us to sit and wait on the bus. But, the Lord Jesus Christ had other plans. Jim asked them what language they spoke and read. They both spoke a little English. One was from Pakistan and could read the English papers Jim gave him, and we also gave him an English New Testament. The other one only reads Farsi, and he was from Iran. So Jim got their names and phone numbers and told them we were going to the bible book store in Nicosia and we would buy them both bibles in their own language. 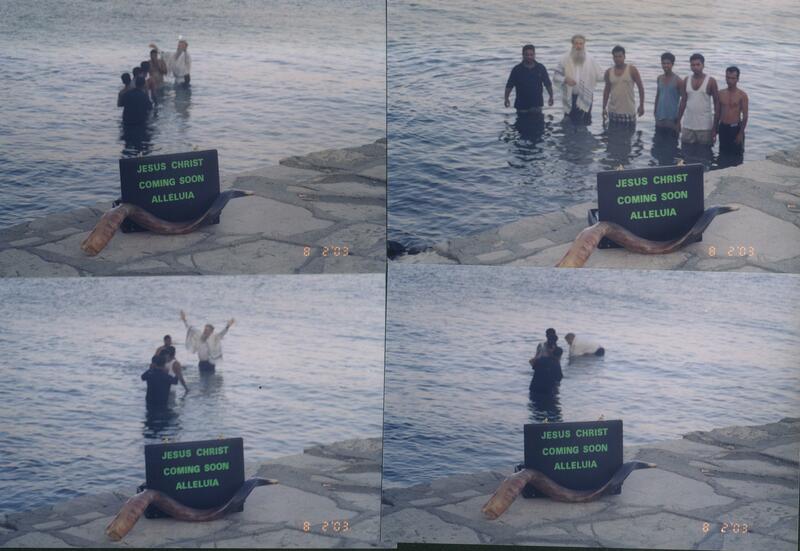 Jim witnessed to them and then got his Bible out of his JESUS CHRIST COMING SOON ALLELUIA - portable billboard briefcase, and the gospel shop was set up for morning traffic, on one of the busiest streets in Limassol. People passing by can see it very good. It is printed in big lime green letters on the cases black background. Jim started reading the bible to all of us. The Iranian was understanding and looking at the words being read and expounded. It was so obvious the Lord had gotten the Iranian's heart. He was receiving the Good News, and the Holy Ghost was making the words of First John come alive in him. It was awesome how God touched him by the Holy Ghost. He confessed he was a sinner in need of the mercy of God, and wanted to know God, and read God's book. Alleluia. The bus came and was almost full. The Pakistani and Iranian both stepped back so we could get on the bus first and have a chance to sit together. Sure enough, that was the last 2 seats together without sitting on the seat over the tire well, which makes for a most uncomfortable trip. It is a one and a half hour trip on this particular bus, it takes longer but it is cheaper, so therefore better for us. We got a back row seat next to an elderly couple from England. Jim and the man set in the 2 middle seats and me and his wife had windows on opposite sides of the bus. She was giving her husband the cold shoulder, so he was glad to talk with Jim. He wanted all of Jim's papers. He was amazed, and we were amazed too, at how he was receiving with understanding the information about these last days and the information in the bible related to Prince Charles. Everybody was wanting to listen in if they knew any English at all. He probably got more gospel on that bus ride to Nicosia than in the last year in the Anglican church. He quickly understood how Subtle and GREAT is the difference in the title "Defender of Faith" and "Defender of THE Faith." One defends THE Faith and the other defends all other Faiths From THE Faith. He was receiving and he really was enjoying the trip. The young man from Iran sat in front of us. Later a Kurd got on and set by the Iranian. They could talk with each other because Farsi and Kurdish language is similar. Then a Bangladesh got on and sat in the isle pull-down seat right in front of us. I had a Bangladesh bible with me. I tapped him on the shoulder, and told him, I believe that Jesus Christ wants you to have this bible. He was so happy when he saw the writing on the cover and opened it up and started reading IMMEDIATELY. I told him to be sure to read from the very first page to the very last page. Jim let him see some pictures of the Bangladeshi brethren that did read from the front page to the very last page, and that how when they had read every page in order that Jim will baptize them. Then a friend of the Bangladesh in front of us came back to the back and folded down the isle seat in front of him and started talking with him. He showed him the Bangladesh bible. He wanted one too, so we got his name and phone number and let him see the pictures. The Kurd that was sitting right next to the Bangladesh was leaning over to see if he could read the Bangladesh bible. Jim asked the Kurd if he would like to have a Kurd bible to read. He said yes, very much so, and promised that he would diligently read one if he could have one. So we took his name and phone number. Then the man sitting in front of the Kurd, turned around in his seat and said, do you have a Russian bible? We said no but we could get him one. Jim went into his briefcase and just happened to have a little book, 50 pages, IN RUSSIAN on how to know God. He took it and was reading it intently all the way to Nicosia. All the while, Jim is carrying on with the Englishman about the Gospel, and the last days events of prophecy, and the antichrist and what all is happening. Most know a little English so there was church in the back of that bus all the way to Nicosia. The Englishman was amazed how everyone around us wanted bibles. I remember Jim telling the Englishman that God had this bus ride all set up before He created the world and there was not much the Englishman could say but Amen, which is pretty unusual for an Englishman these days. We got to Nicosia and walked to the bible book store. On the way we saw the little old man that we always see. He is always so glad to get a paper in Greek from Jim. He was happy. We spent some time at the bible book store visiting with the lady that runs the store looking at all the bibles and choosing the ones we needed. This bible store is a REAL bible store - all there is is bibles - in any language - just bibles. The bookstore lady is now orthodox, not just say orthodox but doing orthodox, no more prayers to Mary, and now she is not just selling bibles but reading her own every spare minute. Alleluia. She had just started reading in the book of First Peter while we were getting the bibles we needed. She had just finished James. I told her that I had just read James. It is so wonderful and covers so much of what it really means to be orthodox and not just say we are orthodox. She helped us to make sure that we were not getting new translations. She no longer wants to get the newest translation, but whatever translation that is translated from the King James Version. Thank you Jesus! We told her goodbye and we hoped to be seeing her soon, if the Lord willed. On our way back to the bus we stopped by a Christian Sandwich Shop to have an orange juice. We always like to visit with the man that owns the shop, he always greets us with open arms. He always lets Jim use his phone and Jim called Pastor Banjo to come join us at the sandwich shop. While we were waiting for Pastor Banjo, we look down the street and here comes the Bangladesh we met on the bus, holding his bible in his hand. We were all amazed we ran into each other. Nicosia is the Capital of Cyprus and the largest city on this island. There are many, many people that live there and there are many busses of tourists that go there. So it was something to see him again among all the people. We all praised the Lord when he got to where we were. He was in a hurry to get to the bus stop so we gave him some tangerines we had, and he went on his way. Pastor Banjo got there and we visited. Jim knew, in the Spirit, something was happening with him before we got to Nicosia. Jim asked Pastor Banjo if he wanted to tell what was bothering him. It was some real difficult pastoral stuff and Jim took him quickly to several sections of the scriptures which directly address the problems with which he is dealing. Pastor Banjo was reading along in his bible and putting book marks in the sections of scripture where Jim was reading with him. He was full of joy at how clearly the scriptures spoke to the problems that he is now facing. He walked with us back to the bus area and we could tell God had really spoken clearly to him and lifted a burden. Jim and Banjo were able to talk more on the way to our bus. It was time for him to leave and pick up his wife. He had pep in his step now. Alleluia Yeshua! While we were waiting for the bus to Limassol a thin young man was standing near us. Jim asked him are you Bangladesh?. He said yes. Jim said are you hungry? He said yes. Jim gave him the money for the bus ride to Limassol figuring that he was having to decide if he was going to ride the bus or eat, because he could not do both. Jim said I have something that I want to show you. Jim showed him his marked up Bangladesh bible that he teaches the Bangladeshis from. I wish you could have seen the JOY on his face. He wanted THAT bible, but Jim couldn't give that one to him. I was the one to mark the key scriptures in the Bangladesh bible for Jim and I tell you it was no small chore. Praise the Lord! I did it with the help of Jesus! So yes, we got his name and phone number. His last name is Kahn-Joy- would you believe? JOY! Alleluia! The bus for Limassol came in and the people are getting on. The same young man got on the Limassol bus. When we got to Limassol the bus stop before the one we get off at, from the back of the bus, comes the Pakistani that we met first thing in the morning at the bus stop. We, of course, had no idea he was on the bus until he was getting off. Jim dug in the bag of bibles we bought and got the Urdo? Pakistani language bible, and gave it to him. He was shocked, and so happy to have the word of God in his own language. Alleluia! Then would you believe, the Bangladesh we met at the stop in Nicosia got off at the same bus stop we did. He lived a block, in the other direction from the direction we go, we are several blocks from there. We hope to see him at the Bangladesh bible study that Jim teaches every Wednesday night, and we can give him his bible then, or, we have his phone number. We can call the numbers we have, and that means we can see them again. Alleluia! Needless to say - This was a day that the Lord had made and had planned from before He founded the world. Thanks be to God! He is an Awesome God! Alleluia Yeshua! Ebenezer knows where the harvest is ready! Now more than ever, as we draw closer and closer to His return, the Good News needs to go forth where the doors are still open and where people are yet unreached. I ask you to support them NOW, and Lay Up for Yourselves Treasures in Heaven, NOW. This man has and will bring thousands of souls that you will meet in the Kingdom of Heaven. Support him NOW, and Lay Up for Yourselves Treasures in Heaven, NOW. More people have been killed for their faith in Jesus Christ, in Africa since 1997, than all martyrs of all history. Just because CNN does not report the massive killing of Christians in Africa does not mean that it is not happening. God has graciously and miraculously spared the recent attempts to murder me. Alleluia! God has given me a call to preach to the unreached peoples of this world. In Nigeria, we are trying to establish a community of faith and refuge. It is in one of the most remote and unreached areas in Nigeria, West Africa. What God has already done over there and the hunger that has been created in the people for the gospel of Jesus Christ coupled with the fact that no one is reaching those precious souls with the gospel, has created a heavy burden in me to be here and preach the Good News of the Kingdom of Heaven. We must have this community of faith and refuge. God has already provided 2000 acres of land. Most of the roads are not motorable. There is no electricity. Most church services are held under trees. There is a great need and we are appealing to your hearts for your help to reach them. A PA system, Bibles, medicines, portable electric generators, and clothing are just some of the items which are desperately needed. Our monetary goal is $250,000, which will help us build this community of faith and refuge for the besieged saints in Africa. We have no food and must have food until God can help us plant and harvest a crop. It is amazing what this small amount of money will accomplish in that part of the world! However, right now I have no food and no money and I am trusting God, Who has called me to this work, to touch the hearts of some of His people who will help us. Please pray and see if God would have you to be part of this remarkable and memorable soul-winning mission? You can by responding to this most worthy cause. Although you may never personally get to go and see these people, know that you can go by your donation to this honorable cause. You will share in every soul that is reached by being rewarded of the Lord for whose sake you are giving. Prayerfully consider what the Lord would want you to do. Be assured that every penny you give will be used solely for this purpose. Your response is needed as soon as possible. We look forward to hearing from you soon.